So, I was at geekcon. It was a blast. There were many interesting projects, and I didn’t get to play with them all. 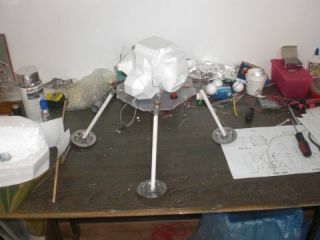 I did get to work a bit on the Lunar Lander from last year, and this year it was finished successfully. My part was the PC game which interfaced with the microcontroller controlling the lander. As you probably guessed, it was written in Python. This year, as promised, I worked on the Automatic Improviser. I worked on it with Ira Cherkes. While the final version worked, it didn’t work well enough, and there is still much work to be done. Still, we had excellent progress. By the way, I know this subject has been tackled before, and I still wanted to try it myself, without reading too much literature about it. One of the components of the system is a beat recognizer. My idea to discover the beat is simple: find the envelope (similar to removing AM modulation), and then find the low “frequency” of the envelope. Instead of doing a Fast Fourier Transform for beat recognition, we were advised that autocorellation will do the trick better and faster. However, when trying to autocorellate using scipy.signal.correlate we discovered that autocorellation was too slow for real time beat recognition, and certainly wasteful. This function takes as input a list of tuples, each of the form (peak_index, peak_value), and returns a mapping between non-zero corellation offsets and their values. After implementing this function, our recognition loop was back to real-time, and we didn’t have to bother with optimizing again. This entry was posted in Algorithms, Math, Programming, Projects, Python, Utility Functions and tagged autocorellation, automatic guitar improviser, geekcon, Math, pyimprov, signal processing. Bookmark the permalink.